In recent seasons Expected Goals has become a staple of analysing player performance in particular strikers looking at the quality of shots they take and how much goals were expected from those shots also it has been implemented in team performance again looking at the quality of chances each team has had. We all know that more than one player is responsible for creating chances so giving credit to the build up seems pretty valuable in analysing player performance in contributing to shots for example crediting centre backs for that line breaking pass before your creative forward players get a shot created. What KeyChain will do is focus on shots within the box to determine who for each team who is involved in the build up to these key chances and how good are the chances that they contribute to. I’m not interested in set pieces as usually the same people take them which would skew the results so I’ll filter out all chances that were created from set pieces. Contributions will include Passes and Crosses in the build up to a key chance but to give more defensive players the credit they deserve I’ve also included the regains of possession as contributions to be credited so it gives a bigger picture of their involvement in key chances from open play. There will be a Total KeyChain which is the Expected Goal of the key chances they were involved in totalled up and there will be KeyChain per 90 which will look at how good the chances are that they contribute to per 90. You don’t need this particular stat to tell you that Celtic players would feature high on any shot creation list however what is notable is the lower end of it. Tom Rogic was injured for around 2-3 months yet still manages to make his way on to a list that has players with double his minutes which is remarkable. 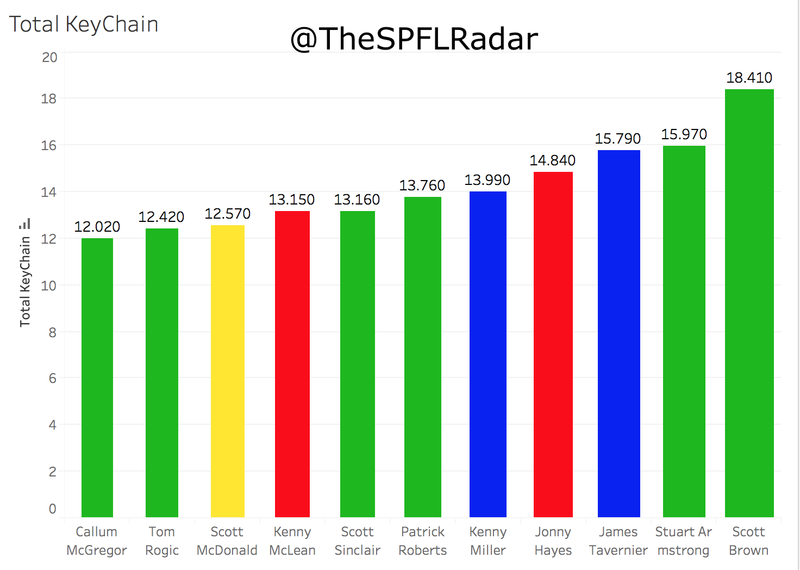 Tom Rogic was on pace for a season for the ages in a team for the ages but in his absence Stuart Armstrong flourished and is second only to Captain Scott Brown in total KeyChain. Scott McDonald will be freed by Motherwell this summer and would be a brilliant signing for any team in the top flight especially one that plays a conventional striking partnership. His Total KeyChain is up there with the league’s top creators in Patrick Roberts and SPFL Player Of The Year Scott Sinclair. McDonald’s partner up top has 15 goals this season, playing next to McDonald it’s easy to understand why. 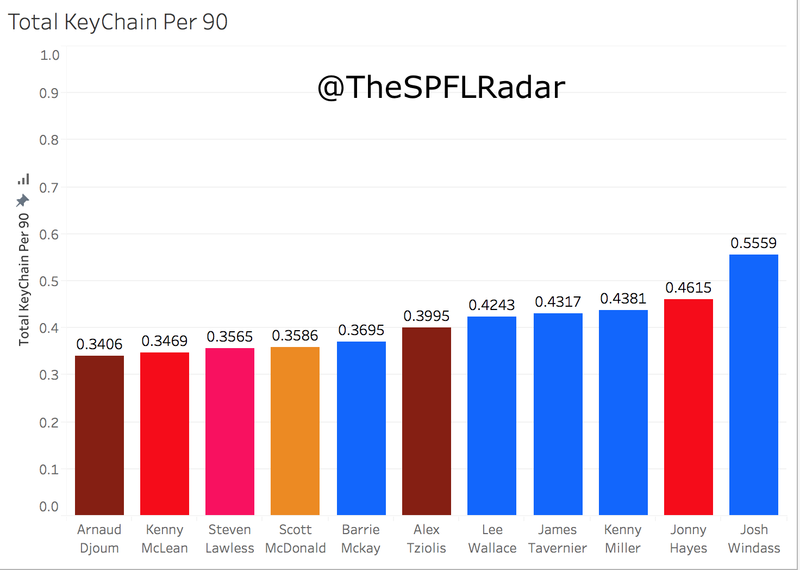 Of those with 1200 or more minutes played 9 out of the top 10 players for KeyChain Per 90 are Celtic players so to give the rest of the league a chance I’ll filter out Celtic’s players and take a look at the best of the rest. There’s the main man again Scott McDonald, not only has he contributed to really good chances he has done it consistently over the season where he has missed very few games and played over 3000 minutes. Again, a bargain as a free agent. Josh Windass has a much smaller sample having played just over 1300 minutes however he has contributed to really good chances in those small amount of minutes. Time will tell if he can sustain those KeyChain stats or if his stats are the by product of a small sample. Steven Lawless of Patrick Thistle makes it onto the list featuring above Kenny McLean who is highly coveted by Aberdeen fans and now Scotland Manager Gordon Strachan. Lawless has played in a Thistle side that has had a terrific season but he may be a great value for money signing for the likes of Aberdeen, Hearts, Hibs or a club south of the border. Finally, Jonny Hayes lead the league in assists this season with 13 in a brilliant season for the Dandies which saw them finish above rivals Rangers, secure a place in Europe and 2 domestic finals. His KeyChain per 90 stats are impressive but unsurprising as he was the only player that hasn’t played in green this season to get a nomination for SPFL Player Of The Year. Hopefully, KeyChain gives a little bit more depth to the conversation rather than just goals and assists etc. KeyChain allows for players to be credited for a defensive action if it ends up resulting in a key chance. A player can be valuable if he or she is contributing to good chances aswell as scoring them. Any questions or queries you can reach me @TheSPFLRadar on twitter.